At Mahindra First Choice Services, we understand the importance of car servicing and the costs involved in maintaining your vehicle. 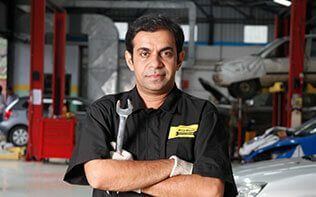 Our uniquely designed car servicing package offer you absolute convenience and help you save on your annual car maintenance expenses. Annual package include services like washing, cleaning, repair works, annual road side assistance and more. Our annual packages help you save on your car maintenance costs by providing best quality services and optimum convenience. SaveFirst from MFCS offers you maintenance option that will take your driving experience to the next level. It’s basically service maintenance contract which is valid for a year.